Several previous studies have confirmed that thrombocytosis was related to reduced survival in many solid tumors. However, the prognostic significance of thrombocytosis in endometrial carcinoma (EC) was still controversy. Therefore, we conducted this study to assess the prognostic value of thrombocytosis in EC. The database including PubMed, MEDLINE, EMBASE, and Web of Science was searched to explore available literature. 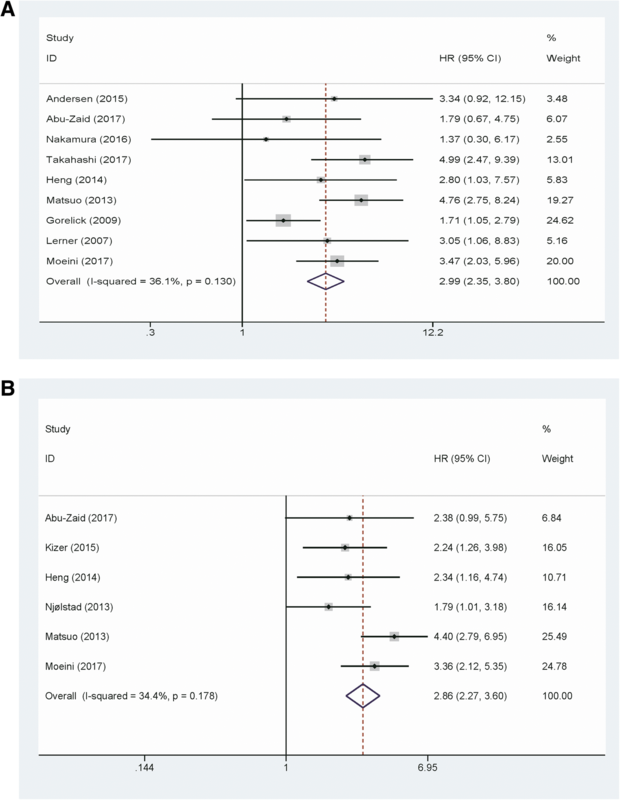 Above all, the hazard ratio (HR), odds ratios (OR) with 95% confidence intervals (CIs) was used to investigate the correlation between thrombocytosis and overall survival (OS) and disease-free survival (DFS). Moreover, the association between thrombocytosis and patient clinicopathological characteristics was explored. Publication bias and sensitivity analysis also were conducted in this study. Overall, 11 studies involving 3439 patients were contained in this study. The results revealed that pretreatment thrombocytosis was significantly related to a decreased OS (pooled HR = 2.99; 95% CI = 2.35–3.8; P < 0.001) and DFS (pooled HR = 2.86; 95% CI = 2.27–3.6; P < 0.001) in patients with EC. Moreover, thrombocytosis was correlated with adverse clinicopathological parameters. Pretreatment thrombocytosis is an adverse prognostic marker in patients with EC. Endometrial carcinoma (EC) remains one of the most common gynecological cancer in developed countries . In China, EC is the third most common female reproductive system malignancy . According to the previous study, the 5-year overall survival (OS) in EC patients with International Federation of Gynecology and Obstetrics (FIGO) stages I-II are 74–91% . However,10–20% early-stages (I-II) and 50–70% advanced-stage (III-IV) patients will recur after primary treatment . Therefore, it is urgently necessary to explore biomarkers that can be used to tailor distinct treatment protocols, identify high-risk recurrence patients, guide postoperative therapy, and determine follow-up protocols. Previous studies have revealed that clinicopathological parameters such as histologic type and grade, FIGO stage, myometrial invasion, lymph node (LN) metastasis, lymphovascular space invasion (LVSI), tumor size, and the patients’ age has prognostic effect in patients with EC [5, 6]. However, these factors usually obtained postoperation and demonstrated to be insufficient to predict recurrence and estimate survival [5, 7, 8]. Thus, it is necessary to recognize more effective prognostic predictors to identify high-risk patients preoperation. Thrombocytosis, often defined as platelet count higher than 400 × 109/L, has been observed correlate with prognosis in various malignancies such as lung, renal, gastric, colorectal and hepatocellular cancer [9–13]. In gynecologic malignancies, pretreatment thrombocytosis was associated with decreased survival in ovarian, vulvar and cervical cancers [14–16]. The prognostic role of thrombocytosis in EC also has been reported in several studies, but the conclusions were controversy [17–29]. Therefore, we conducted this meta-analysis to elucidate the prognostic value of pretreatment thrombocytosis in EC. We identified relevant studies by searching database including PubMed, MEDLINE, EMBASE, and Web of Science. The search was updated in August 2018. The search strategy was as follows: (((((((“Endometrial Neoplasms”[Mesh]) OR endometrial cancer) OR endometrial carcinoma) OR endometrium cancer) OR endometrium carcinoma)) AND (((((((“Thrombocytosis”[Mesh]) OR thrombocytosis) OR thrombocythemia) OR platelet count) OR blood platelets) OR platelets) OR platelet)) AND (((((“Prognosis”[Mesh]) OR prognosis) OR prognostic) OR survival) OR mortality). This study was performed following the Preferred Reporting Items for Systematic Reviews and Meta-Analyses (PRISMA) guidelines (Additional file 1) . The including criteria were as follows: (1) EC was diagnosed by histopathological examination; (2) platelet count was measured preoperation; (3) hazard ratios(HRs) and their 95% confidence intervals (CIs) for platelet count can be obtained; (4) the cut-off value of thrombocytosis was provided. The exclusion criteria were as follows: (1) letters, meeting abstracts, reviews; (2) articles not written in English; (3) studies with duplicate data; (4) incomplete data for evaluating the HR and its 95%CI. The candidate articles were assessed by two reviewers independently. Any disputes were resolved through their discussion. 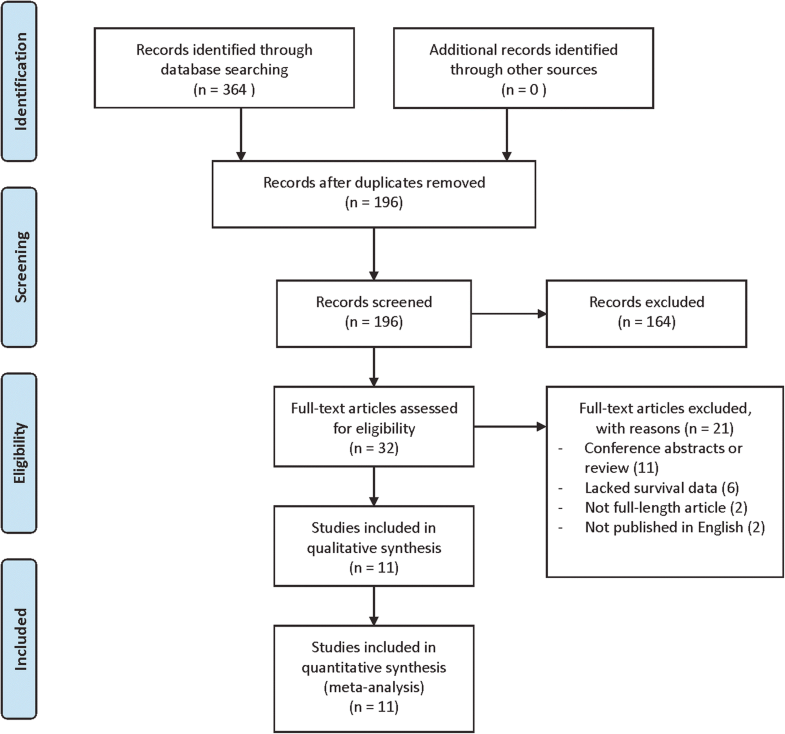 In the light of the guidelines for meta-analysis of observational studies , two reviewers independently extracted data from the selected literature. The obtained data were as follows: the first author name, study publication time, country, sample size, FIGO stage, grade, LVSI, histological type, LN metastasis, recurrence, the cut-off value of thrombocytosis, venous thromboembolism (VTE), follow-up time, and primary outcome. The Newcastle-Ottawa Scale (NOS) scoring system was used to assess the quality of selected articles . High-quality studies were defined as NOS score more than six (Additional file 2). The HRs and 95% CIs were used to evaluate the prognostic significance of thrombocytosis on EC. Additionally, the correlation between thrombocytosis and clinicopathological characteristics were analyzed. Heterogeneity analysis was assessed using Chi-square test based on the Q value and I2 statistic value. Using a random-effects model, or using a fixed-effects model was determined by the level of heterogeneity (e.g., P-value < 0.1 and/or I2 > 50%, the random-effects model was used). Besides, we conducted a sensitivity analysis to validate the stability of the pooled outcomes. Begg’s test and Egger’s test was used to assessing the publication bias. The data in our study were analyzed using STATA 14.0 software (Stata Corporation, College Station, TX, USA). The flow diagram illustrated the search procedure (Fig. 1). After the preliminary search, we identified a total of 364 articles. First, we removed 168 duplicate articles, and another 164 irrelevant items also were excluded. The remaining 32 full-text articles were left for further review. Among them, six studies were excluded due to lack of survival data. Next, we excluded two non-English articles, 11 conference abstracts or reviews, and two not full-length articles. Finally, 11 eligible studies were involved in this meta-analysis. All of the qualified studies were observational retrospective studies. The main characteristics of the eligible studies were summarized in Table 1. A total of nine studies including 2609 EC patients provided the overall survival data for analysis. The results revealed that elevated platelet count correlated with poor OS in EC patients (pooled HR = 2.99; 95% CI = 2.35–3.8; P < 0.001) (Fig. 2a). Subgroup analysis was conducted to further investigate the prognostic role of thrombocytosis on OS in patients with EC. 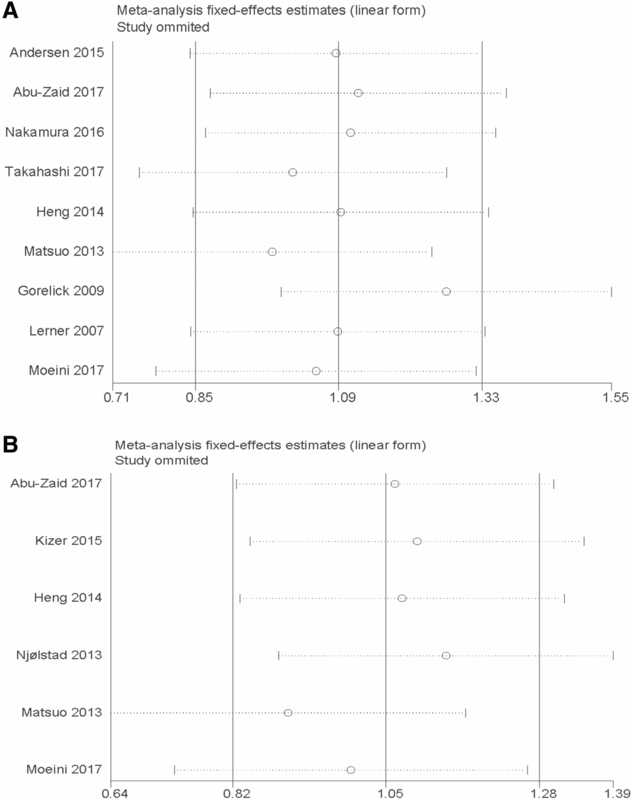 We observed significant results in subgroup analysis based on the study region (Asian vs. Non-Asian), sample size (< 200 vs. ≥ 200), FIGO stage (I-IV vs. III-IV), and analysis method (Multivariate vs. Univariate). In subgroup analysis according to the cut-off value of platelet count, a significant result was observed in the platelet count = 400 × 109/L group (HR = 3.05, 95% CI = 2.39–3.89, fixed effects). However, platelet count = 350 × 109/L group did not predict poor prognosis for EC (HR = 1.37,95% CI = 0.3–6.17, fixed effects) (Table 2). Six studies contain 2460 patients were included to evaluate the correlation between thrombocytosis and DFS in EC patients. The result showed that thrombocytosis predicted a worse DFS in the fixed effects model (pooled HR = 2.86; 95% CI = 2.27–3.6; P < 0.001) (Fig. 2b). We further analyzed the correlation between thrombocytosis and clinicopathologic characteristics (Table 3). Thrombocytosis was positively related to FIGO stage (odds ratio (OR) = 3.24; 95% CI =1.78–5.88; P < 0.001), tumor grade (OR = 1.89; 95% CI =1.3–2.76; P = 0.001), LN metastasis (OR = 3.13; 95% CI =1.71–5.75; P < 0.001), LVSI (OR = 1.98, 95% CI =1.34–2.94; P = 0.001), cancer recurrence (OR = 8.57; 95% CI =3.71–19.83; P < 0.001), and VTE (OR = 6.45; 95% CI =4.06–10.24; P < 0.001). However, thrombocytosis was not associated with histologic type of EC (OR = 1.45; 95% CI = 0.76–2.77; P = 0.265). There was no apparent publication bias for OS (P = 0.917 for Begg’s test and P = 0.740 for Egger’s test) and DFS (P = 0.707 for Begg’s test and P = 0.192 for Egger’s test) (Fig. 3) in our study. Additionally, a sensitivity analysis was carried out by sequentially omitting eligible studies. The results confirmed the stability and reliability of the outcomes (Fig. 4). The critical role of platelets in inflammatory and immune responses has been confirmed . Several studies have indicated that elevated platelets play crucial roles in promoting cancer growth and metastasis . The interactions between platelets and cancer cells activate TGFβ/Smad and NF-κB pathways, subsequently inducing the occurrence of epithelial-mesenchymal transition and promoting cancer metastasis [34, 35]. Platelets promote cancer metastasis also depending on the activating of YAP1 signaling through the RhoA / MYPT-PP1 pathway . Additionally, activated platelets lead to the release of tumor growth factors and chemokines, such as platelet-derived growth factor (PDGF), vascular endothelial growth factor (VEGF) and CXCL5 and CXCL7, which stimulate cancer growth and metastasis [37, 38]. Furthermore, platelets protect cancer cells from the immune clearance by natural killer cells, which also accelerates cancer metastasis . Thus, there exists a complex cross-talk between platelets and cancers. The elevated platelet counts more than 400 × 109/L often defined as thrombocytosis. Thrombocytosis has been proved to correlate with adverse prognosis in many malignancies. The incidence rate of pretreatment thrombocytosis was range from 7 to 24.8% in the included studies. Our results demonstrated that pretreatment thrombocytosis predicts a worse OS and DFS in patients with EC. In subgroup analysis, we showed that the elevated platelet count also reveals a decreased OS in patients with EC except in subgroup analysis by platelet count cut-off value. Using 350 × 109/L as platelet count cut-off value did not predict a poor prognosis. Moreover, we investigated the association between thrombocytosis and clinicopathological characteristics in EC patients. According to our findings, pretreatment thrombocytosis was significantly associated with advanced FIGO stage, tumor grade, LVSI, LN metastasis, recurrence, and VTE. However, pretreatment thrombocytosis was not related to the histologic types. Our meta-analysis also has some flaws. First, EC patients mostly accompanied by menorrhagia or abnormal uterine bleeding, which always leads to anemia . Patients with thrombocytosis commonly coexist with iron deficiency anemia . The included studies did not classify whether anemia-associated thrombocytosis or paraneoplastic thrombocytosis was related to prognosis. That may lead to potential confounding. Second, all of the included studies were retrospective studies, which may cause selection biases. Third, the cut-off values for definition of thrombocytosis differed in the included studies. Most of the studies used 400 × 109/L as cut-off value of platelet count to diagnose thrombocytosis. However, one of the studies used 350 × 109/L as the platelet count cut-off value . The distinct cut-off value may lead to apparent heterogeneity between studies. Thus, establishing a consistent platelet count cutoff value to diagnose thrombocytosis is necessary. Last but not least, several factors such as patients’ age, tumor size, adjuvant therapy, which will affect platelet count did not include in our analysis. Therefore, more studies are needed to verify our findings. In conclusion, this systematic review demonstrated that pretreatment thrombocytosis is correlated with poor survival outcome and adverse clinicopathological parameters in EC, and thrombocytosis is a potential prognosis predictor for EC. D.N. conceived the analysis, performed literature search, and wrote the manuscript; E.Y. contributed to the analysis; Z.Y.L. conceived the analysis, contributed to the analysis. All authors approved the final version of the manuscript.